Note: tickets have been sold out for this event! 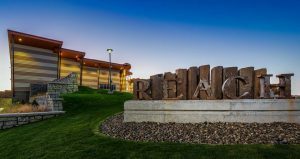 The Tri-Cities Women in Business Conference is Eastern Washington’s largest career and professional development event for women, drawing over 400 conference attendees, over 700 luncheon attendees and 40 show exhibitors. The inspiring experience brings together female leaders in every season of life to share insights, exchange ideas and empower their careers. The all-day conference boasts multiple keynote and breakout presentations featuring the finest, most knowledgeable experts in their fields, as well as the ATHENA Awards luncheon, which honors two of the top women leaders in our community. The Tri-Cities Women in Business Conference is the can’t-miss event of the year! STOMP is explosive, inventive, provocative, witty and utterly unique– an unforgettable experience for audiences of all ages. The international percussion sensation has garnered armfuls of awards and rave reviews and has appeared on numerous national television shows. The eight-member troupe uses everything but conventional percussion instruments – matchboxes, wooden poles, brooms, garbage cans, Zippo lighters, hubcaps – to fill the stage with magnificent rhythms. Year after year, audiences worldwide keep coming back for more of this pulse-pounding electrifying show. As the Boston Globe says, “If you haven’t seen STOMP, GO! If you have seen it, take someone and share the pleasure!” STOMP. See what all the noise is about. 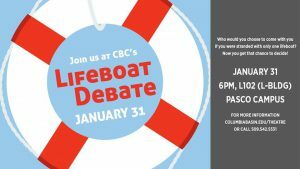 From 6 p.m. – 7 p.m.
Have you ever wondered who you would choose to come with you if you were stranded with only one lifeboat? Now you get that chance! CBC Professors from various departments will provide evidence and argument in an effort to convince you to choose their field of expertise. Bring your smart phones to this fun and informative event and vote for your favorites that night! Coordinated by the CBC Communication Studies Department. Thursday, Friday & Saturday at 7 p.m.
Saturday Matinee at 2 p.m.
All 37 of the Bard’s plays in 97 minutes! 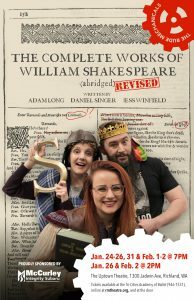 Three madcap actors weave their wicked way through all of Shakespeare’s comedies, histories, and tragedies in one wild ride that will leave you breathless and helpless with laughter. This show is an irreverent, fast-paced romp that may be most enjoyed by those age 13 and older. The play includes bawdy (sexual) and crude humor and stage violence. Note: food donations are also being collected for 2nd Harvest! Inspired by the real life ‘Newsboy Strike of 1899 in New York, Newsies is the tale of how a ragtag, group of newsboys unite to make the world a better place. 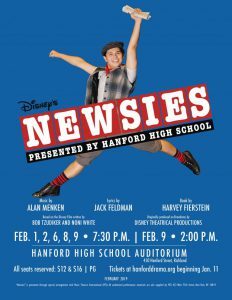 This high energy musical is the story of newsie Jack Kelly, who dreams of a better life far from the hardship of the streets. But when Pulitzer and Hearst raise distribution prices at the newsies’ expense, Jack finds a cause to fight for and rallies his army of newsies to strike. From 2 p.m. – 4:30 p.m. 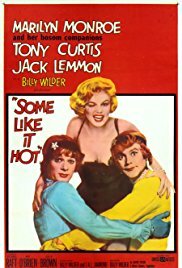 The Tri-City Film Club begins its Spring 2019 Film Series with one of the all time great screen comedies, Some Like It Hot, starring Marilyn Monroe, Tony Curtis, and Jack Lemmon at their best. Billy Wilder, one of the all time great directors, co-wrote and directed this fantastic movie. Set in 1929, Lemmon and Curtis are out of work musicians who witness the St. Valentine’s Day Massacre. Fleeing for their lives, they disguise themselves as female musicians in order to get to Florida and away from the mob. 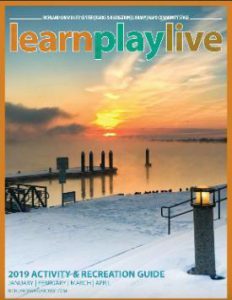 Community Education is the perfect opportunity to try something new or rekindle your desire for learning. Class offerings include language, crafts, arts, health, gardening, travel, music, business, finance, technology, and more. 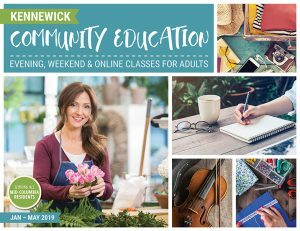 We now offer more than 100 local classes and more than 300 online classes to make learning more accessible than ever before. The Winter & Spring course catalogue is now online. 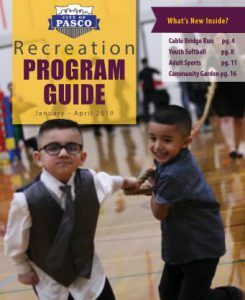 The Parks & Recreation Departments for Pasco, Kennewick, and Richland have published their Winter & Spring activity catalogs that you can view online. Monday-Thursday: 8:00 a.m. – 8:30 p.m. 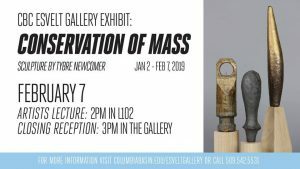 This solo exhibition will feature the ceramic sculpture of Tybre Newcomer. His most recent sculptural work is Modernist in style, taking inspiration from the forms of traditional hand tools. Concerned with the idea of the endangered craftsman, Newcomer’s work is both a look to the past, while also exploring how craft is used today, in the present. 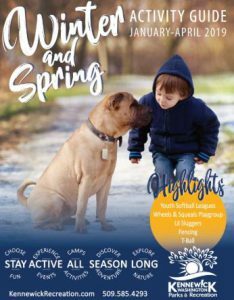 The shows runs through February 7. 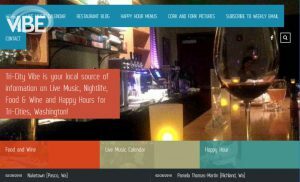 For information about museums, historical societies, and history for Tri-Cities Washington and other nearby towns & cities in Southeast Washington and Northeast Oregon, visit: https://tri-citiesguide.org/history.htm. – February 1: Cell! Cell! Cell! 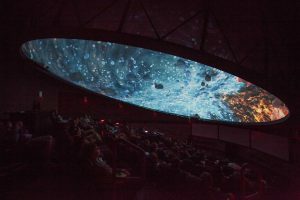 at 7 p.m. and Oasis in Space at 8 p.m.
– February 2: Secrets of the Sun at 2 p.m. and Stars of the Pharaohs at 3 p.m.